Richard Branson is shown in this 2014 photo at the British Polo Day in Morocco. Entrepreneur Richard Branson is adding his name and money to a new privately-owned rail line in Florida. The branding comes at an important time for the new service, as its expanding to Orlando. A privately owned passenger rail company in Florida is getting a new partner. Since August, Brightline has been running sleek, new trains between Miami, Fort Lauderdale and West Palm Beach. The company plans to extend the line to Orlando and eventually to Tampa, and it will have a new partner, Richard Branson, and a new name, Virgin Trains USA. From Miami, NPR's Greg Allen reports. GREG ALLEN, BYLINE: In Miami, also Fort Lauderdale and West Palm Beach, the new Brightline stations are impressive structures with lots of space inside for restaurants and retail shops. There are already many dedicated Brightline riders, like Katherine Robinson, who uses it to commute to Miami daily from her home in West Palm Beach 75 miles away. KATHERINE ROBINSON: The service is incredible. The train itself is brand-new. The stations are very well designed. It's takes two minutes to walk through the parking garage over to the station. I love it. ALLEN: For now, passengers are benefiting from discount prices intended to encourage ridership, as low as $10 each way between Fort Lauderdale and Miami. With trains running around 80 miles per hour, it's not high speed. It's what some of the industry are calling higher speed rail. When the line is extended to Orlando, the company says the three-hour ride will shave an hour off the current four-hour trip by car from Miami. But just as the brand was getting established, Brightline has announced it's getting a new name. The company entered into a partnership with the Virgin Group and its founder, Richard Branson. 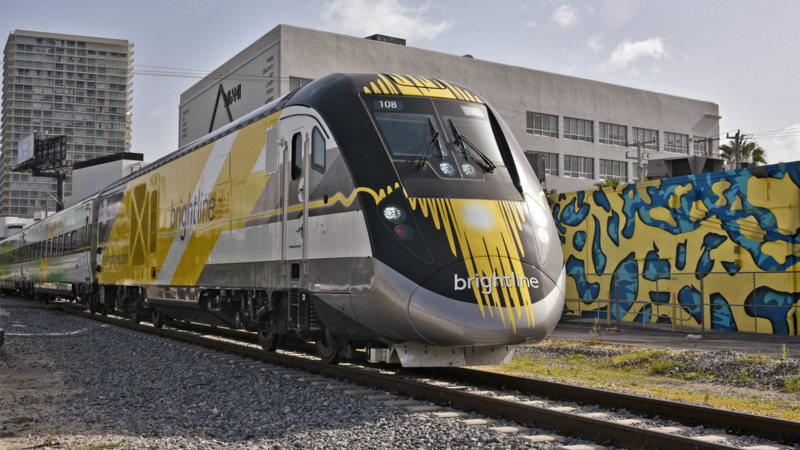 By next year, Brightline says its trains will all have a Virgin Trains USA logo. Branson is a minority investor in the U.S. company. At a news conference in Miami, he said Virgin has 20 years of experience operating passenger trains in Britain. But what he brings mostly to this partnership, he says, is his brand. RICHARD BRANSON: With the Virgin brand, I think we're good at generating a lot of people to use our products who wouldn't normally consider using something like trains. And I think once they've used, you know, the Brightline Virgin Trains network and they haven't had to sit in traffic for hours on end, I think they'll use it every day. ALLEN: The partnership and new branding comes at a critical time for Brightline. It's the only privately owned intercity passenger rail company operating in the U.S. and its financial prospects are uncertain. In a regulatory filing, the company recently disclosed the loss of some $87 million the first nine months of this year. Passenger revenue, just $5 million, is far below the $24 million for the year originally projected. Ben Porritt with Brightline says ridership fell short because train service between Miami and West Palm Beach was delayed eight months later than originally planned. BEN PORRITT: We're a relatively new service, but our ridership is consistent with other successful intercity rail companies, including Virgin Trains U.K., Eurostar and Excela in the northeast corridor of the United States. ALLEN: The same day it announced its partnership with Virgin, Brightline unveiled plans for a public stock offering - a move that would raise funds to fuel the company's expansion in Florida and beyond. Greg Allen, NPR News, Miami. A $1.7 billion high-speed rail system that would connect Tampa to Orlando is expected to begin operating in 2021. That's according to a Securities and Exchange Commission filing released last Friday. The country's first private high-speed rail service is opening this month in Florida, promising to transform congested South Florida highways by taking as many as 3 million cars off the road.